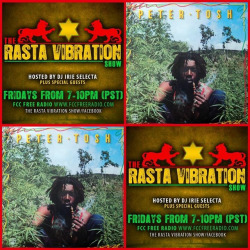 Tune inn to The Rasta Vibration Show on FCC Free Radio tonight! We will be providing tunes for the ART Millennium SF 2016 happening tonight in our building so come by check out some art and catch a vibe! It all goes down with Dj Irie Selecta 7-10pm(pst) on www.fccfreeradio.com Live in Studio 1A!